Fashion Polish: First post : "Les Perles de Chanel"
First post : "Les Perles de Chanel"
Today is a pretty special day for me because I've been postponing starting my own blog for a long time now. 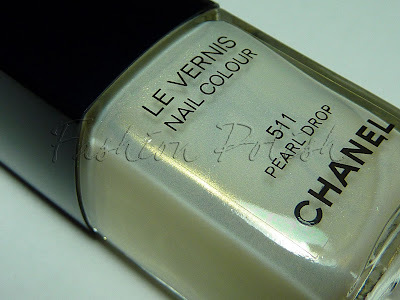 So I wanted to try and make it special for you too by showing you the most anticipated Chanel Spring-Summer 2011 nail polishes : Black Pearl and Pearl Drop from the "Les Perles de Chanel" Collection. "I wanted to keep a link with the fashion show. The ground was covered with white gravel, I wanted the feet have a touch of white. As for nails, they recall the English garden with black details that were used." 513 Black pearl is a beautifull and very shinny deep grey, pearl, opaque in 2 coats. 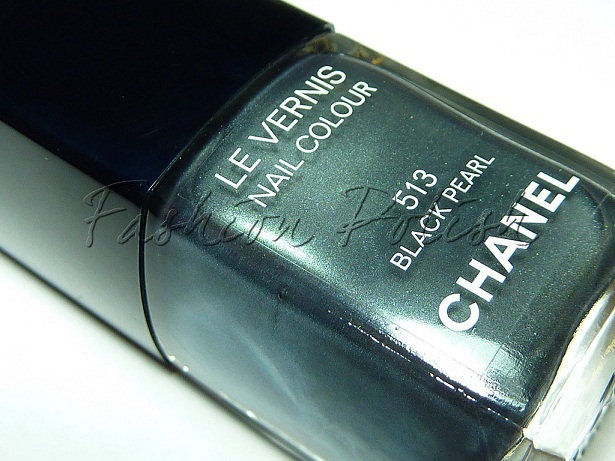 It is quite similar to the average tahitian black pearl. 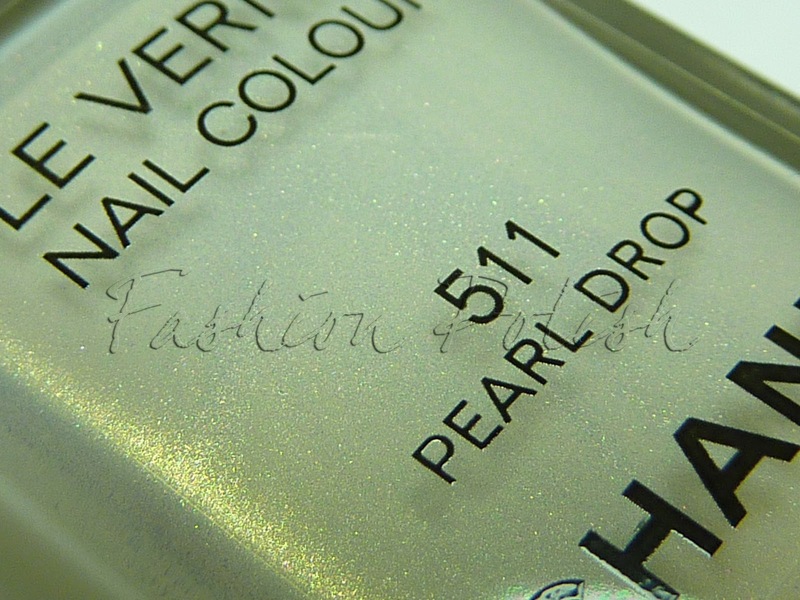 Just like all pearl finishes, you'll have to be carefull with brushstrokes, although they tend to be less visible when they dry. A lot of people have been wondering if it had some green in it and I can tell you it does, you can see one the bottle close up all those tiny green particles and because they are so small, they add depth to the polish. 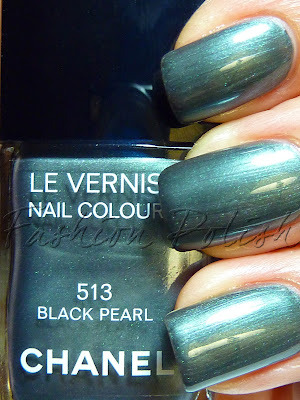 Now, I must admit that I didn't like it when I first saw it on my nails but a couple of minutes later, it really grew on me, now I can totally picture myself wearing it with a beautifull tahitian pearl ring; which I'd have to buy, ha ha. 511 White Pearl is a shiny pearly white that flashes gold, with 2 coats you can still see VNL (visible nail line). You can see it below with 1 coat on the ring finger, 2 on the middle and 3 on the index. It might not translate that much on the picture but there definitely still is VNL with 3 coats. I'm not a sheer girl but I think I like it better with just 1 coat, not that I would wear it like that on a daily basis, maybe at work, if I had restrictions. 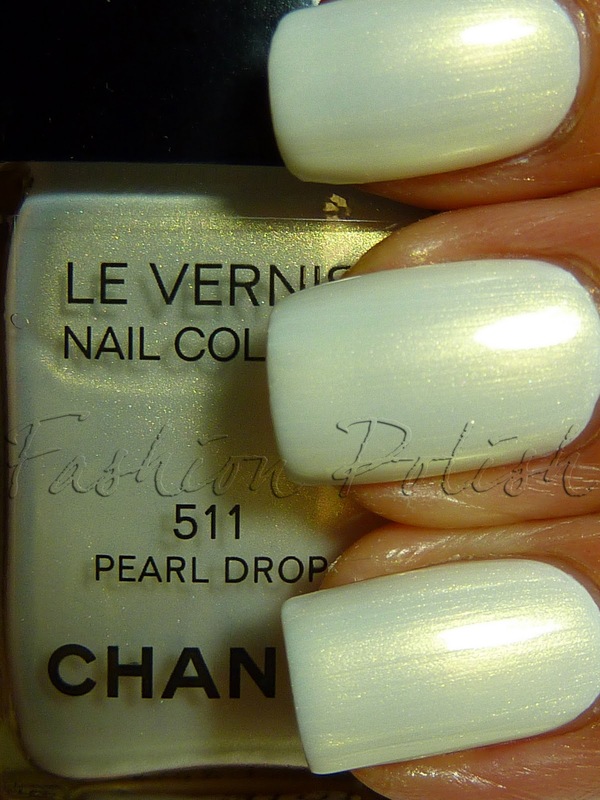 This is why I layered it over white (2 coat Alpine Snow, 2 coats Pearl Drop), maybe I'd use that combination as a base for a nail art, I don't know but there is something about that pearly white that screams winter to me. Just like Black Pearl, same finish, you'll have to be carefull with brushstrokes. That's it for today, thanks for reading and please don't be too critical, this is all new to me. 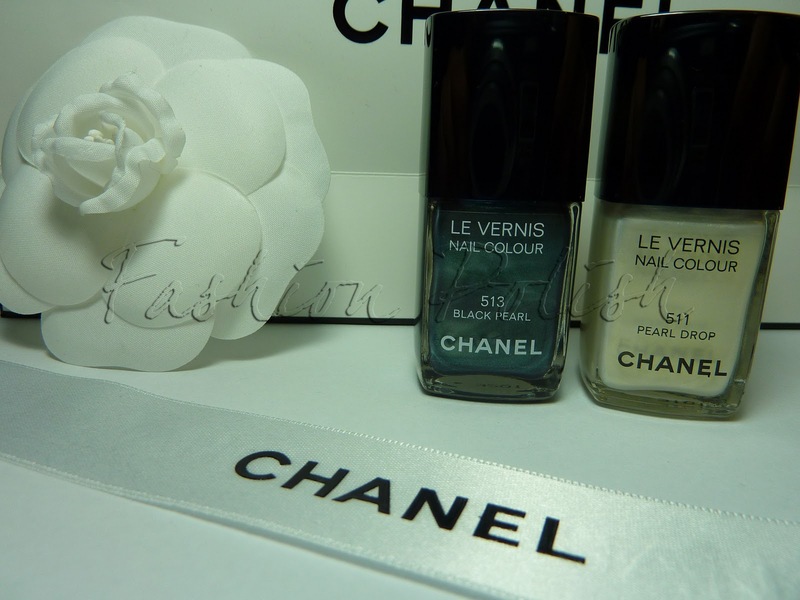 Edit : I am giving away a bottle of Chanel Black Pearl, you can enter here. These are wonderful, and your nails are beautiful! Thank you! Hello! I stumbled across your blog and I am here to say welcome lol! 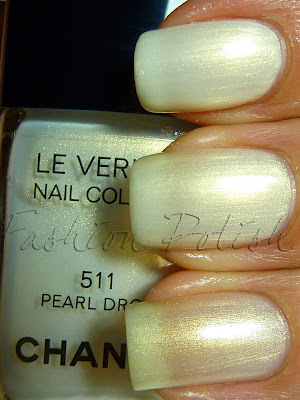 I've been waiting for swatches of these and I have shared this post on Specktra.net in the CHANEL Spring 2011 forum! I linked your post so all credit goes to you =D. Black Pearl looks marvelous but I'm apprehensive about Pearl Drop...I'm too lazy to layer polish on lol. Thank you for sharing and I hope to see more posts! Juujubez, I hear you, layering is a pain but sometimes you do get someting interesting; as for pearl drop, like I said, not my type of color but I'm sure a lot of people will like it. Hi! And welcome to blogging.....you'll do amazing!! First of all, how on earth did you manage to score these polishes, you lucky, lucky girl?! Congrats on that!!! I've been writing about this collection for some time now and it's nice to finally see them swatched! 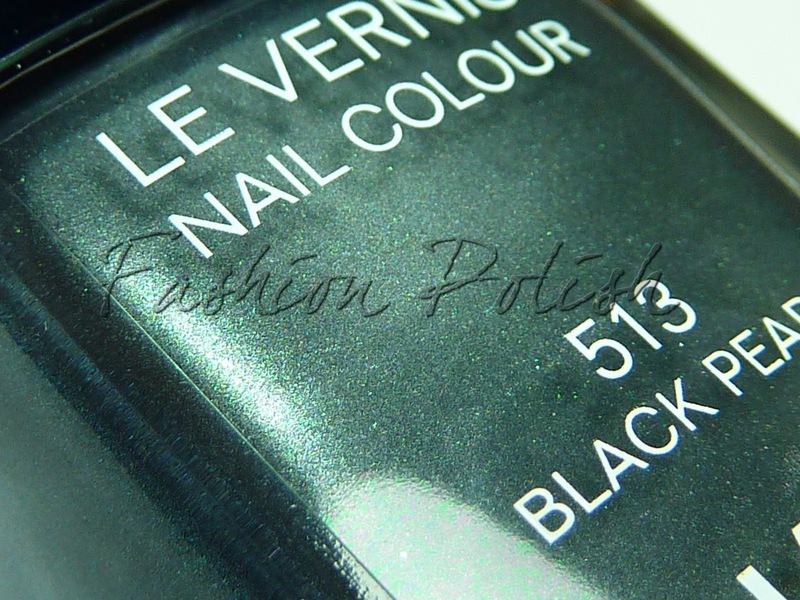 Your nails are stunning and the colours look amazing with your skin tone...wear them proudly! I will definitely be adding your great article to my blog and linking back to give you full credit for all your hard & great work! Happy Belated Birthday as well!! I guess I've been a really good girl this year so I got these as an early christmas gift, haha. Thanks for the link on your blog, I just checked it out, and actually I've been reading you before. Thanks so much for the swatches! I can't wait to get my hands on these. Happy Belated Birthday! What a wonderful first post! I am definitely into both of these shades, especially Black Pearl. It reminds me of OPI Jasper Jade. Not a dupe, maybe a cousin? Can't wait to see your next post! Jasper Jade is soooo cool, too bad it's discontinued! trop cool ces couleurs !! Congrats on starting a polish blog!! Great first post...new Chanels and all. I'm thinking that white one will make my Work Nails look elegant and refreshing come spring. I am the proud new mother of a baby lemming. You have good reason to be proud, I love babies so much, please give him (or her) a big kiss from me.